I know you want one =). When I first began to create the recipe for this cookie I started with a chocolate cookie dough made from scratch. I hated the taste the cocoa left behind, or something. So, after 2 previous failed attempts at the perfect chocolate cookie (and lots of cookie dough tossed in the trash), I now have the perfect chocolate cookie. This recipe starts with a brownie mix and they are amazing to say the least! 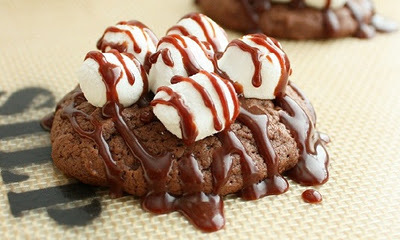 If you like chocolate or brownies you will love this cookie (and I mean come on who doesn’t like chocolate and brownies? =). It even reminds me of those amazing chocolate covered marshmallows that I love. This recipe is a must try! These cookies are luxurious! 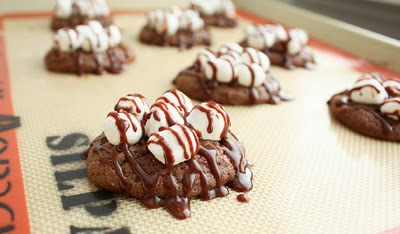 You may also like to try S’mores Cookies, they taste just like a S’more! Who doesn't love this flavor combo of chocolate and marshmallows? These cookies are dreamy! Preheat oven to 350 degrees. Butter a cookie sheet and set aside. In a large mixing bowl, whisk together brownie mix, flour, brown sugar and salt. Add in eggs and milk and stir with a large spoon. Add in melted butter and vanilla and stir until well blended. Spoon dough by heaping tablespoonfuls onto greased cookie sheet (you can fit 12 per sheet). Bake for 9 minutes and remove from oven and top each cookie with about 6 - 7 marshmallows (you may have to push down on the marshmallows slightly to keep them from rolling off). 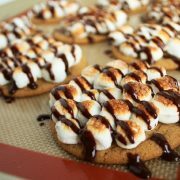 Move oven rack near the top of the oven and return cookies to oven to bake 2 more minutes until marshmallows soften. Remove from oven and set cookies aside. In a small microwave safe mixing bowl combine chocolate chips, butter and water. Microwave chocolate on 50% in 30 intervals stirring after each interval until melted and smooth. Pour mixture into a small ziploc bag. Cut a small tip off the end and drizzle over marshmallow brownies cookies. Store cookies in an airtight container. 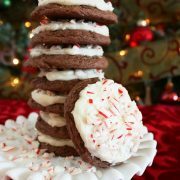 Stacy’s Snippets: These will be amazing with the new peppermint mini marshmallows that I found the other day at walmart!!! 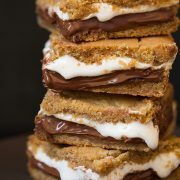 Totally making them this weekend! New follower from……hmmmm…not really sure?